I feel like i had a pretty productive weekend, painting-wise. The weather was crap, so it's an easy decision to stay indoors. And we didn't have any pressing business to take care of, so painting was at the top of the agenda. I'm feeling more and more confident with my ability to control the paint and my results. I used to be under the impression that if something initially didn't look just right, it was a lost cause and overworking the paper and paint made just an ugly mess. Now i'm realizing how malleable the medium really is. I think making the concertive effort to paint is paying dividends. Malcolm Gladwell asserts in his new book "Outliers" that mastery of a skill takes about 10,000 hours. He used an example of young piano players and differentiating between the ones who appeared to be truly gifted and those that were merely proficient. People assumed that a few players had a gift or genetic advantage over the proficient piano players, but further investigation reveals the "gifted" players had practiced much more than the others, at least 10,000 hours says Gladwell. 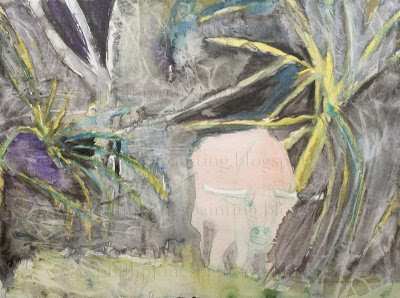 Jackie Chan asked me why i'd been making so many little paintings lately. I wanted some little ones in case people were starting their search at etsy.com with lower prices, and if i had offerings at those prices, it would at least get them into my shop and some exposure to the bigger higher priced paintings. The big painting alone in the shop wasn't getting any viewings. I also wanted to use the smaller ones to practice and quickly experiment with less paper expense. Sunday i decided to make a big one because making larger paintings is quite different than how quickly little ones are done and i should also practice making the big ones. I started by taping a 20 x 24 sheet of 140 lb Strathmore paper to my clip board. I used the brown gummed tape rather than the green painters tape because i tried to stretch the little sheets last week and they still buckled and waved when wet and later dried buckled when i used the green painters tape to stretch the paper. The little sheets were of only 90 lb paper stock so being lighter weight might have also limited the ability to resist waving. This big painting on 140 lb Stratmore paper didn't wave, so i'll have to try the brown gummed tape on the lighter paper to see if it's the paper or the tape that matters. 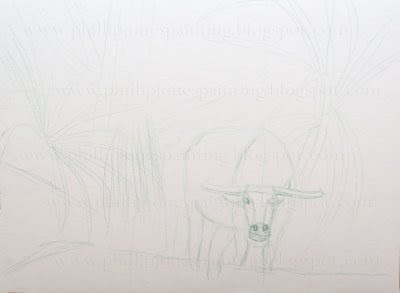 I made a rough sketch referring to a photo i took at the beginning of March of a carabao in the Philippines. I dived right in painting all the negative areas with black paint. My new confidence that i could re-shape it later no matter if i started with the light areas or the darks took the painting quickly to the tone i wanted it to be. 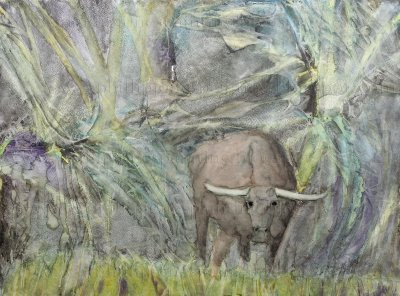 When i got to this point it was starting to become clear that i'd never be satisfied with a photo realistic "Robert Bateman" kinda painting, and that spending the hours necessary to paint each and every plant leaf wasn't how i wanted to paint either. I used the cellophane film AGAIN, yes. But this time i think it was really appropriate because lying the film in the wet paint and then shaping the wrinkles to curve the way i want really resulted in a natural plant like impression. It looks pretty much done to me, although i might thin the girl's snout and perhaps make the foreground rise again on the right? And sign it.